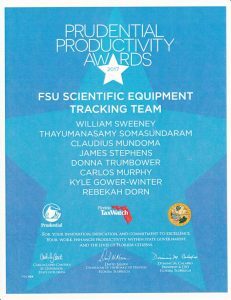 FSU submitted a proposal for Prudential Productivity Award for Scientific Equipment Database and Web Portal search. Later the deadline was extended to Dec 9, 2016. The premise was: “In an effort to cut down on the costs associated with duplicate science equipment purchases and leverage existing technologies to meet an emerging need, the Scientific Equipment application was created by an interdisciplinary team to promote the shared tracking and use of equipment across the University community“. 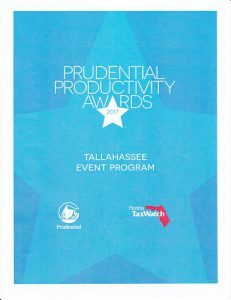 The Florida Tax Watch, the organization which gives the award described the award the following way: The Prudential Productivity Awards are made possible through the generosity of Prudential, as Anchor Sponsor, and the vision of the late J.E. Davis and A.D. Davis, co-founders of Winn-Dixie Stores Inc. and co-founders of Florida TaxWatch. 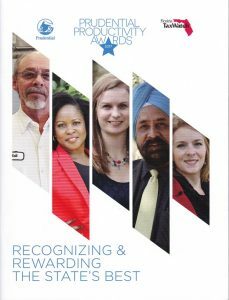 Since 1989, the Awards program has publicly recognized and rewarded state employees and work units whose work significantly and measurably increases productivity and promotes innovation to improve the delivery of state services and save money for Florida taxpayers and businesses. 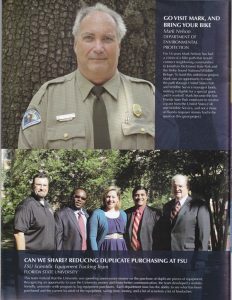 Over the 28-year program, more than 16,000 nominations have been received, and awards have been given to state employees for saving or maximizing state dollars to the tune of more than $9.2 billion. FSU ID#: 404– William Sweeney, Thayumanasamy Somasundaram, Claudius Mundoma, James Stephens, Donna Trumbower, Carlos Murphy, Kyle Gower-Winter, and Rebekah Dorn. 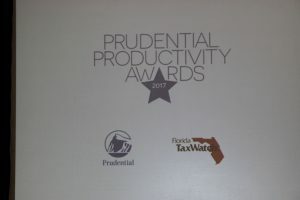 Our team FSU ID# 404 was given the 2017 Prudential Productivity Award at a ceremony at the Donald L Tucker Civic Center. The Civic Center doors opened at 11 AM and we went in and sat in the front section at an area designated for FSU teams. FSU had more than a few teams. The Provost joined our team members and walked over to receive the plaque. After receiving the plaque, our picture was taken and we gathered some lunch. 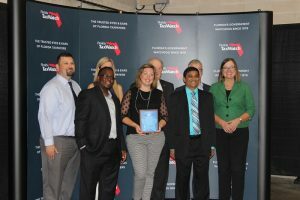 Then there were several speakers including the team from the organization that gives the award, the agency heads, the sponsors, and coordinators.